Our very own Tony Gebely traveled to Sri Lanka from August 6 – 14 to cover the 150th Anniversary of Ceylon Tea. As a guest of the Sri Lanka Tea Board, he was given unfettered access to the events in Colombo, many of the country’s tea estates, and the Sri Lanka Tea Research Institute. This post is the first in a series covering his tea adventures in Sri Lanka. Sri Lanka was a major producer of coffee in the 17-1800s until the island nation’s coffee industry was completely wiped out by a disease known as coffee leaf rust (Hemileia vastatrix). The eradication of Sri Lanka’s coffee plantations paved the way for a tea industry that thrives to this day. It all began in 1867 when Scotsman James Taylor planted 19 acres of tea plants at Loolecondera Estate in Kandy using seeds he acquired from Assam. This first planting marked the commencement of Sri Lanka’s tea industry and now, in 2017, we celebrate the 150th anniversary of Ceylon Tea through a series of commemorations. 300 delegates from around the world joined the Sri Lanka Tea Board at the Bandaranaike Memorial International Conference Hall (BMICH) for the Colombo International Tea Convention. 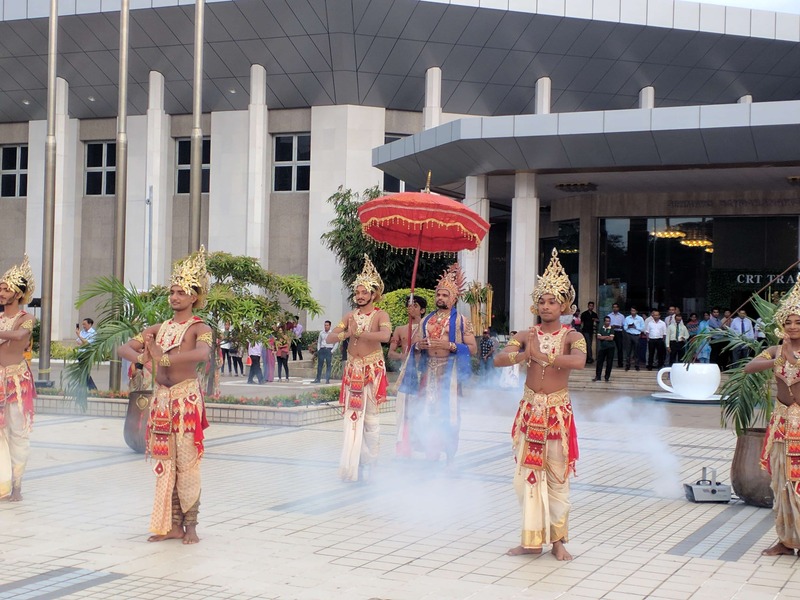 The convention began on August 9 with much fanfare, there was a ceremonial lighting of an oil lamp, the singing of the Sri Lankan National Anthem, and a spectacular traditional dance number. Following the traditional dance, the crowd was addressed by the Minister of Plantation Industries, Navin Dissanayake and the Prime Minister of Sri Lanka, Ranil Wickremesinghe. Dissanayake remarked, “Ladies and gentlemen, go back to 1967, 50 years before. Take a snapshot of the tea industry, where was it then, and where is it now? Then, in 1967, two years before I was born, it was largely large estate parcels of land run by large companies that were producing the tea. Today, the picture is completely different. Today, a social revolution has happened during the last 3 decades, and that was, the growth of the smallholder sector in Sri Lanka. [The] dynamics have changed and today, smallholders account for 73% of the production of Ceylon Tea.” This is a reference to the Land Reform Act of 1972 wherein the Sri Lankan government assumed control of the large British tea companies that dominated the industry by asserting that no one company could own more than 50 acres of land for the production of tea. This led to the proliferation of the smallholder. The Prime Minister of Sri Lanka, Ranil Wickremesinghe surmised the state of the Sri Lankan tea industry in 2050, asking that with 2 billion more people on the earth, how will Sri Lanka rise to meet the demand for tea? Wickremesinghe also pointed out that the greatest challenge Ceylon Tea will face in the future is climate change. While I only attended the opening ceremony of the convention, the event continued for 3 days with talks from notable tea folk such as Merrill J. Fernando, founder of Dilmah Tea, Anna Paula Tavares, Executive VP of the Rain Forest Alliance, and Peter Goggi, President of the Tea Association of America. During this time the FAO Intergovernmental Group on Tea also held a dialogue between tea delegates, international policy makers, and members from the private sector. Held from August 11-13, the Coconut Rubber and Tea Trade Fair was a public event serving Sri Lanka’s 3 main exports. The event opened with a beautiful and boisterous dance troop that served tea and snacks as part of their performance. Even the biscuits were celebrating the 150th Anniversary of Ceylon Tea! As you can see, I ran into Geesa from Glenwood Reserve Tea Factory on the floor of the trade fair. He poured us some of his Ceylon Sheng Puer and black tea made from the cultivar used for Silver Tips, TRI 2043. Both were outstanding. Also in attendance was Lumbini Tea Factory and a number of companies that produce white-labeled tea products for export. 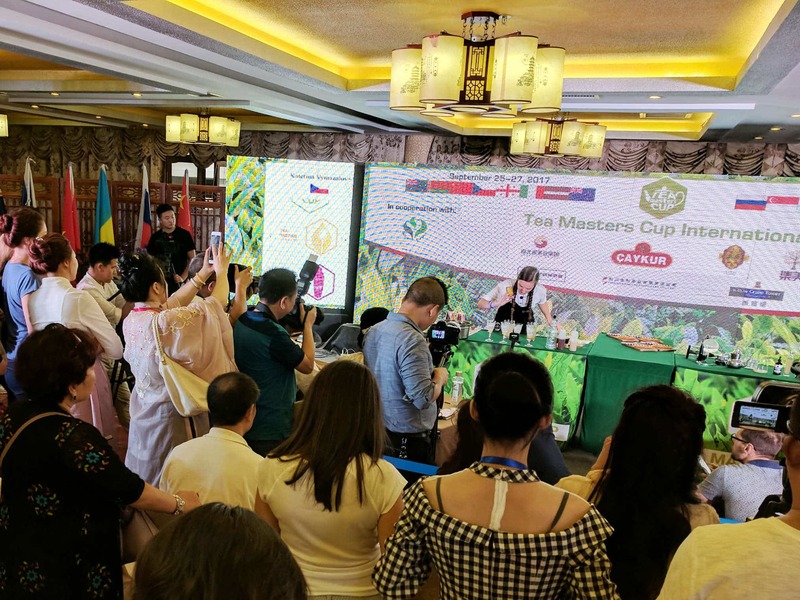 The Ceylon Tea Festival was a series of tea, food, and music events held in Colombo from August 11-13 aimed at tourists and millennials. I was able to attend 3 parts of the event, starting with a live concert and tea-inspired street food at Arcade Independence Square. I ran into the fabulous Gail Gastelu of Tea House Times, and listened to a great cover band play hits from the 1990s. I have to say, the band was quite the nostalgia bomb! After the concert, we were treated to a Ceylon Tea Masterclass put on by Niraj De Mel of Mel’s Tea Academy. He showed us examples of the different grades of black tea produced in Sri Lanka as well as the styles other than black tea that are produced there. We were able to go down the line and taste samples from each major growing region and Niraj did a wonderful job teaching us about each region. We capped off the festival by attending a 5-course dinner + wine pairings by Two Michelin Star Chef Tom Aikens atop the Mount Lavinia Hotel by candlelight. The meal started off with truffled cauliflower cream with tangy edamame foam and continued with blue crab with coconut, coriander and Ceylon Tea infused jelly. Next up was tamarillo sorbet, basil, extra virgin olive oil and lime snow followed by brined and smoked earl grey duck breast with shiitake ketchup and honey aubergine. The meal concluded with watermelon and green tea, coconut and chili. It was definitely one of the most remarkable meals I’ve experienced. The fact that it took place on a balcony overlooking the Indian Ocean, or that we were treated to a private fireworks display, was an added bonus. I should also mention that those in attendance were basically a who’s-who in the tea world, so lucky me. This post is just a taste of my experiences in beautiful Sri Lanka, more to come soon including a visit to the Colombo Tea Auction, an overview of the growing regions in Sri Lanka, a look at the smallholder sector and a glimpse into the growing specialty Ceylon tea market. Note: Ceylon is the British Colonial name for Sri Lanka. Though no longer used to identify the nation, the Ceylon namesake is still associated with the tea produced there.